Time to check your pulse. Whether you’ve made a resolution to cut down on meat, or you’re just broke after music festival season, let me introduce you to your new best friend — lentils. I know what you're thinking, but there is so much more to the humble lentil than the stereotypical vegan food of times gone by. These legumes pack a serious punch in terms of nutrition, value, and flavor in these easy lentil recipes. But first, we all know that protein is an essential part of our diet. Not only is it vital for tissue growth and repair, but this macronutrient helps to stabilize blood sugars, regulate your mood, and keep you feeling fuller for longer. Meat lovers will be surprised to hear that uncooked lentils have more protein than beef. Of course, you'll probably want to cook those lentils before eating. About a half a cup of cooked lentils (100 grams) contains 9 grams of protein. So, not as much as say a steak of the same size, but the lentils also contain about 32 percent of your daily value for fiber, so you'll feel fuller, longer. You probably know that quinoa is also a great source of protein, but you may not know that a cup of cooked lentils has about double the amount of protein of the same quantity of quinoa. If you need further convincing that this protein packed pulse is worth adding to your diet, lentils are also high in iron, potassium and a B Vitamins. If the health benefits aren't convincing you, then let's talk money. Many people seem under the false impression that being vegetarian, vegan, or just eating healthily is expensive. So, let me break this down for you. A 1 pound bag of Goya lentils from Whole Foods costs $2.49, while 1 pound of 83 percent lean ground beef from Whole Foods cost $7.69 (prices may vary per store/area). So, if you use this example and swapped a little over 2 cups cooked lentils for the two 5.5 oz burgers you made for one week, and do that for a year, you'd save $260 per year. There are several different varieties of lentils, but the most common are green, red and brown. Green lentils: often referred to by the french lentilles vertes, these have a peppery taste, stay firm when cooked and retain a bit of crunch, and are ideal in salads. Red lentils: these are mild and slightly sweet and break down when cooked, so they are great for thickening soups and stews. Brown lentils: these are the most common variety. They soften but hold their shape well and can be used to make chunkier soups and stews, or as a side dish. If you’re too lazy to cook, you can easily buy lentils canned or in microwaveable pouches, but lentils really require minimal skill or effort. Here are eight easy recipes to get you started. Due to religious customs, vegetarianism used to be pretty popular in India. So, unsurprisingly, lentils are a staple in Indian cooking and used to make a variety of dishes, both savory and sweet. Lentil curry is part of the everyday diet, eaten with rice and roti. This recipe uses Indian flavors to make an easy, warming and filling weeknight meal. Most student kitchens don't come with a dishwasher, so one-pot meals are a godsend when it comes to washing up. Chilli con carne is a favorite when it comes to feeding a crowd. Use lentils to make an equally easy and delicious vegetarian version and serve with the usual accompaniments of rice, tortilla chips, sour cream, cheese, and, of course, guac. No one will even miss the meat. Lentil soup is a staple winter warmer in my family. Mum always cooks a big batch before my sister and I arrive home for the holidays to give us some much needed nutrition after a hard semester. Anna Jones, author of "A Modern Way To Cook," also one of my favorite vegetarian cookbooks, adds lemon and crispy kale for her twist on this classic taste of home. Spaghetti bolognese is without a doubt a student staple. Swapping in lentils for minced beef means that veggetarians don't have to miss out on this simple supper. Once you've got this recipe down, don't limit yourself to spaghetti. Use the sauce to make lasagnes, other pasta bakes, and combine with cooked rice to make easy stuffed peppers. Forget the dry, frozen veggie burgers (often more like ice hockey pucks than food) that you were fed as a vegetarian child. Whip up a batch of these lentil patties, add your favorite toppings, and sandwich between your bun of choice for the ultimate veggie barbecue. Veggie bowls (also known as Buddha Bowls) are my go to weeknight meal. All you need is some cooked grains, protein, veggies, and a dressing (my favorite is this tahini dressing). You can throw it all together in an easy, nourishing, and very versatile bowl of goodness. 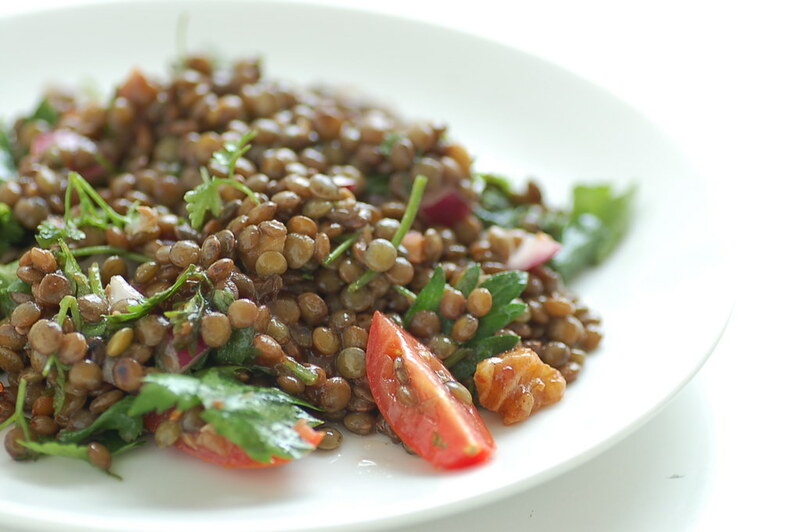 Lentils are a great way to add an extra hit of protein to your salads. I have tried and tested this simple recipe several times and it always goes down a treat, packed with fresh herbs and tied together with a zesty dressing. The recipe serves 12 and, speaking from experience, is a great choice for a veggie pot-luck dish, but can also be scaled down easily to feed a smaller crowd (or just yourself). If you haven't come across Israeli-born chef Yotam Ottolenghi yet, then get yourself a copy of "Plenty" ASAP. The book celebrates several different ingredients, with a chapter dedicated to, you guessed it, lentils. This easy and flavorful recipe is a great sharing dish. Why not go all out and prepare an Ottolenghi-style Middle Eastern spread next time you're feeding a crowd. What are you waiting for? Add more lentils to your diet this year and say hello to a healthier, wealthier you. Because who doesn't love sitting there with a spoon devouring the whole container.